Research note* 19 Apr 2012� We do not have proof that Nancy Horne was the daughter of Cullen Horne and Elizabeth Cowart, either. I did find cemetery records for Cullen and his wife (below) in Macon County, GA, so I would suggest looking there for some sort of probate record. There is probably also a Bible record floating around somewhere, since Cullen and his wife both have exact dates of birth and death. See FindaGrave.com for a picture of the stone. Susan Culpepper, 9, F, GA.
+ Gilleann Culpepper, 30 Dec 1824 - 15 Jun 1898. Joel Culpepper, 1 M0-10, 1 M16-26, 1 M26-45, 1 F10-16, 1F 26-45. + Infant Culpepper, 25 May 1859 - 25 May 1859, Inf. of D.C. & M.A. Culpepper. Joel Culpepper, 1 M0-5, 1 M10-15, 1 M30-40, 2 F0-5, 1 F5-10, 1 F10-15, 1F30-40. Joel Culpepper, Cannons District, Wilkinson Co., GA, drew lot 1036/2/1 in what became Forsyth Co., GA and lot 64/1/2 in what became Cobb Co., GA, 1832. Joel Culpepper, 1 M5-10, 1 M40-50, 1 F0-5, 2 F5-10, 1 F10-15, 1 F40-50. Benjamin Culpepper, 9, 1, 2, 5 (#3240). Dooly Co., GA Wills Book A-1. Mary G. Culpepper, 14, F, GA.
Mary Culpepper, 62, F, GA, Framing, $0/$1000. On 31 Mar 2010, Tim wrote: "The story about David's being fatally wounded at Chancellorsville doesn't completely mesh with what I've been able to find in the records. David C. Culpepper is listed in the confederate service records for the 50th Georgia as having been sent home on 30 day furlough by a surgeon. No further record, and no indication he died at Chancellorsville. I can't find another David C. Culpepper in confederate service records." 1840 Census* 1 Jun 1840� Chadwell was listed as the head of a family on the 1840 Census on 1 Jun 1840 at Dooly Co., Georgia. Chadwell Culpepper, 1 M0-5, 1 M5-10, 1 M30-40, 1 F0-5, 1 F5-10, 1 F20-30. Shadwell Culpepper, 2 M5-10, 2 M10-15, 1 M15-20, 1 M40-50, 2 F0-5, 2 F10-15, 1 F 30-40. Andrew Culpepper, 3, M, GA.
1840 Census 1 Jun 1840� Frances was probably a free white female, age 30 and under 40, in Chadwell Culpepper of Dooly Co., GA's household, on the 1840 Census on 1 Jun 1840 at Dooly Co., Georgia. 1840 Census* 1 Jun 1840� David was listed as the head of a family on the 1840 Census on 1 Jun 1840 at Dooly Co., Georgia. Biography � David Sneads Culpepper moved with his family about 1835 from Laurens County, Georgia, to Dooly, now. Crisp County, and settled in this immediate vicinity at what is now Daphne. Their first home was a one-room rough-log house with shed on one side for the slaves to sleep in. Cooking was done outside in the open. Later a better house was built -- a double-pen log structure, ruins of which are observable a short distance west of the flowing well at Daphne. This bible was said to have originally been the property of David Sneads Culpepper (29 Jul 1816 - 5 Mar 1886), son of David Culpepper and Elizabeth Hogan. It was given to his youngest daughter, Julia Emma Culpepper Brown, who is thought to have made many of the entries in it. She died childless, and at her death it was given to her great-nephew, Samuel Jackson Culpepper, son of Thomas Albert Culpepper. Samuel died on 3 Jul 1970 in Crisp Co., GA, but the Bible had been given to his youngest son, Leon Raines Culpepper in 1962. On 1 Mar 1985, Leon, who did not have any natural male children, gave the Bible to his nephew, Perry Melton Culpepper, Jr. (Melton)39. Leon had had the Bible repaired, but the original cover was retained. When the Bible was received by Melton, there was a small photograph of Julia Brown taped on the inside leaf in the front. As of August 2004, Melton still owns the Bible and has willed it to his son, Jackson Campbell Culpepper. Melton also wrote the text above. Photocopies of the Bible's family history pages have been provided to the Georgia Department of Archives and to Culpepper Connections! The transcription below was done by Warren L. Culpepper, publisher of Culpepper Connections! In so far as possible, the sequence, wording, spelling and style were all retained exactly as found. Text in parentheses represents notations by Warren. The parenthetical text following each entry gives (1) the relationship of the person to David Sneads Culpepper and (2) that person's #number within the Culpepper Family Tree. Based on Warren's analysis of handwriting styles, he believes that the events dated prior to 1867 were written by one person, and subsequent events by another, probably Julia Culpepper Brown. 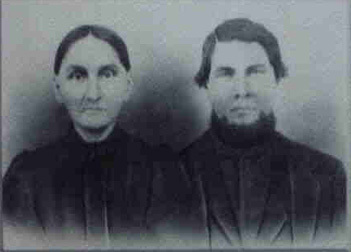 David Culpepper and Catherine Livingstone on 8 Jan 1835 in Laurens Co., GA.
D. S. Culpepper, 1 M0-5, 1 M20-30, 1 F0-5, 1 F20-30, 1 F30-40, 1 F50-60. - Ruth A. Culpepper, February 6, 1844 - November 22, 1909. George C. Evert, 22, M, Physician, GA.
D. S. Culpepper (17 slaves): 65F, 55F, 40M, 38M, 36M, 30M, 28F, 26F, 13M, 11F, 9M, 7M, 5F, 5M, 4F, 4M, 1M. J. C. Culpepper, 7, F, GA.
Administration Letters 1856-1873, page 78. Julia Culpepper, 15, F, GA.
Carrie Mukly, Other, F, S, Black, 16, Farm Hand, GA/GA/GA. Judge W. Fleming, Crisp County, Georgia: Historical Sketches, 1931:. " 1840 Census 1 Jun 1840� Katherine was probably a free white female, age 20 and under 30, in David Sneads Culpepper of Dooly Co., GA's household, on the 1840 Census on 1 Jun 1840 at Dooly Co., Georgia. Biography* � Sarah and her husband moved from Dooly County, GA, to Alabama, where a daughter Sarah J. Godwin, was born in 1855. By 1860 the family was in Marianna, Jackson County, FL. Sparkman was killed in the Civil War, and Sarah's whereabouts after the war are unknown. She may have re-married. Biography* � Julia G. Leyard received the following from another researcher in October 1999: "The Conner Family Bible that Nell Dolihite has at Castleberry has the name Martha J. Culpepper and her birth date, June 18, 1837. I was told by Nell over twenty years ago that this Martha J. Culpepper was her grandfather (Richard H.) 's first wife. I don't remember a death date for her, only the birth date. I wrote this in my notes. The story of a first wife was known to me before I knew of your facts." And in February 2000: ". I have some more info for you. Martha Jane b. June 18, 1837, d. Aug. 23, 1857. Sophia A. J. b. June 25, 1856, d. Oct. 17, 1856." Richard H. Conner and Susan E. Monroe were married August 1st A.D. 1858, at the home of the bride (Columbia, Al.) by John Parker, Esquire. Witnessed by A. J. Armstrong and Harriet E. Monroe. Benjamin Culpepper, 22, M, $---/$600, GA.
E-mail written May 2008 to Warren Culpepper from DeLois Crews (d/o #46718), Saint George, GA, e-mail address. Susan Culpepper and George W. Powell on 04 Jan 1857 in Worth Co., GA, Book 1, page 21. James Culpepper, 1 M20-30, 1 F15-20. Jesse R. Reynolds, Cousin, M, Feb 1876 (24), S, GA/GA/GA. Joel Culpepper, 2, M, GA.
Lucy Culpepper, 9, F, GA.
Ida Folsone, Other, S, Female, MU, 10, GA/GA/GA, Domestic Servant. David C. Culpepper, Colquitt Co, GA, Enlisted on 22 Mar 1862 as a Private and mustered into Co. H, GA 50th Infantry, Wounded 3 May 1863 Chancellorsville, VA. Died of wounds on 23 Jun 1863 at Home. A small crowd gathered on the square in Troy Wednesday to honor the Confederate soldiers who served during the conflict that is often called the “Second American Revolution” or the “War for Southern Independence. Although Monday, April 24 was the official observance of Confederate Memorial Day, the Pvt. Augustus Braddy Camp of the Sons of Confederate Veterans and the local United Daughters of the Confederacy chose to honor their ancestors on April 26, Confederate Memorial Day. But as time went on, names including Manassas, Shiloh, Sharpsburg, Fredericksburg, Chancellorsville, Gettysburg and Chickamauga became familiar to everyone, both North and South. Everyone had felt the reality of war, with its hardships and its pain. McLendon said that the dedication of the young men of the South is exemplified in the story of a young Georgia farmer. “Gen. Peter McGlashan said that when he was colonel of the 50th Georgia Infantry at the battle of Salem Church during the Chancellorsville campaign, he received word that a young private wanted to see him. The colonel found Pvt. David Culpepper lying on a stretcher. Doctors gave him no chance of survival. A bullet had struck him in the temple, tearing out both eyes. “We Southerners realized that the South lost the war and we would surely not want to fight that terrible conflict again. But the same code of honor that drove our ancestors drives us today to insure that their sacrifices and the values they cherished are not forgotten. McLendon closed the ceremony with the words of President Calvin Coolidge in an address at a Confederate Memorial Day service at Arlington National Cemetery. David Culpepper and Martha A. Simpson on 12 Aug 1849 in Dooly Co., GA.
David C. Culpepper and Martha Ann E. Simpson on 12 Aug 1849. Martha A. Culpepper, 18, F, GA.
William E. Culpepper, 3, M, GA.
"Confederate Memorial Day remembers soldiers", published 27 Apr 2006 and submitted to Culpepper Connections by Wm. Flake Joiner. Mary Bondurant Warren, Family Puzzlers. #977, Jul 10, 1986, p 18-19. Martha E. Culpepper, 22 Sep 1831 - 19 Sep 1912. David Culpepper, 7, M, GA. Pages 261-262: Martha A. Culpepper, widow of David C. Culpepper of Co H, 50th GA, she lived in Worth County, GA.
David F. Culpepper, Son, M, S, 17, Farm Laborer, GA/GA/GA. Martha A. Culpepper, Mother, F, 79, Wid, GA/GA/GA. Trying to find info on parents or siblings of Green Collier, b abt 1829 birthplace unk, married Martha A. Culpepper (dau of Joel W. Culpepper & Mary Butler) abt 1850, possibly in Dooley Co, Ga. Children were Joel Allison Collier, Piety Carrie Collier & Josephine Collier. May have been other children. Mikey M. S. T. Culpepper and Tillman Cato on 23 Dec 1851. Mitchell County Court of the Ordinary, Mitchell Co., GA Marriages, 1861 – 1960, Salt Lake City, UT: Genealogical Society of Utah, 1967 Repository: LDS Family History Library - Salt Lake City, Call # Films # 522,772 - 522,780. Elizabeth Culpepper and W. J. Ragan in 1861 in Mitchell Co., GA.
William C. Culpepper and Sarah J. Kempt on 4 Aug? 1877 in Thomas Co., GA, Book I-104. Sarah Culpepper, Wife, M, Female, W, 21, GA/GA/GA, Keeping House. Annie Kemp, Niece, F, 20, S, GA/GA/GA. Lucy Culpepper, Sister, F, Jan 1861 (39), S, GA/GA/GA. Mary J. Culpepper, Sister, F, 54, Single, GA/GA/GA. Mary C. Smith died 26 Aug 1929 in Mitchell Co., GA, Certificate 22004-K.
Lucy A. Culpepper, d. 15 Feb 1947 at 86 years in Mitchell Co., GA; Res. in Mitchell Co., GA.
+ Lucy Ann Culpepper, 25 Jan 1861 - 15 Feb 1947, Row 1. Lucy Culpepper, Aunt, 68, Single, GA/GA/GA. Sarah C. Culpepper, Wife, F, Md, 20, Keeping House, GA/GA/GA. Willie Spring, Boarder, M, 45, sng, GA/GA/GA, Farm hand.